Operating a 401(k) retirement plan can be a lot of work, and employers may not have time in the day to adequately monitor plan performance and participant outcomes. Enter CoPilot. CoPilot was designed to help employers save time on plan administration responsibilities and reduce investment fiduciary risk, while helping employees reach their retirement goals. Ideal for owner-only businesses and partnerships, Plan4One 401(k) plans operate just like big company 401(k) plans—allowing you to decide how much you’d like to contribute as both the employee and the employer. Planning for a comfortable retirement is a major concern among American workers—one that many expect their employers to help out with. And while the employer benefits of sponsoring a 401(k) are numerous, they aren’t always obvious. There are many benefits of integrating payroll with your 401(k) plan—saving you time and money, reducing manual errors, and minimizing your administrative tasks as the employer. Download this information sheet to learn all about the benefits of payroll integration and find out what the integration process looks like. PAi has partnered with multiple payroll providers to offer a fully-bundled retirement solution to employers. Learn about our payroll partners and integrated software platforms to find the one that works best for your business. PAi has also partnered with various payroll providers that our employers are already utilizing for their payroll services—allowing employers to “snap on” providers for an integrated retirement solution. Stay on track with all of the compliance dates and deadlines you need to know as an employer sponsoring a retirement plan. To maintain a tax qualified status, 401(k) plans must undergo and pass a variety of compliance tests. Learn more about the 401(k) compliance tests the plan will need to pass, including non-discrimination, coverage, and top heavy testing. Setting up a new 401(k) retirement plan or converting an existing plan can be time-sensitive, so it’s important to stay up-to-date on upcoming sales deadlines—especially as year-end approaches. Choosing the retirement plan that’s going to be the best fit for your business can be difficult, especially when there are many viable options to choose from. Learn about the key benefits of CoPilot 401(k) and CoPilot IRA, then compare the similarities and differences between both retirement savings plans with this visual guide. 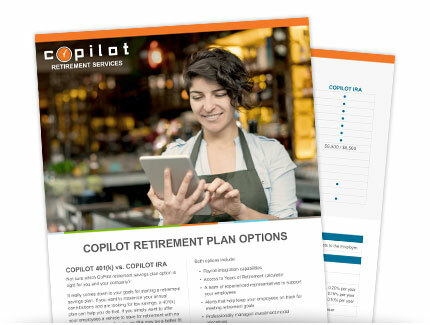 Learn about the benefits, features, and pricing for CoPilot’s newest retirement solution: the CoPilot IRA. Help your employees get started on the path to retirement readiness by educating them on the features and benefits of the CoPilot IRA retirement savings solution.